Ring Stones Earthwork Worsthorne, Lancashire. South-eastern side. OS grid reference: SD 8863 3301. On Worsthorne Hill above the two Swinden reservoirs at the east side of Burnley, Lancashire, there is a rectangular-shaped earthwork which has often been considered to be Iron Age in date, but it appears to be Romano-British, and most probably mid to late 4th century AD. It is similar in design to the Bomber Camp Earthwork, near Gisburn, Lancashire. 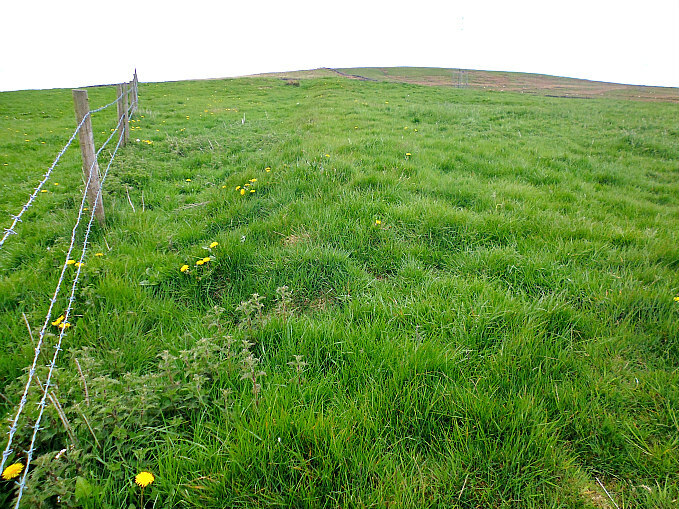 This quite large site is also called ‘Slipper Hill Earthwork’ and ‘Hameldon Pasture Earthwork’. It is conjectured to have been a Romano-British farmstead, or maybe a temporary camp, although without any “real” concrete information that is still ‘open to question’. The site can be reached from St John’s Church in Worsthorne. From here take the Gorple road going eastwards on what becomes a rough track for about ¾ of a mile. Take the track on the left just after Brown Edge Farm, climb over two stiles and continue along here for 600m, eventually climbing a 3rd and 4th wall stile. The site is in the field to the right. There is a stile but it’s on the wrong-side of the earthwork; so the two gates are in the way and the site seems to be on ‘private land’. You can probably reach the earthwork from a path at the the north-western side of the field. 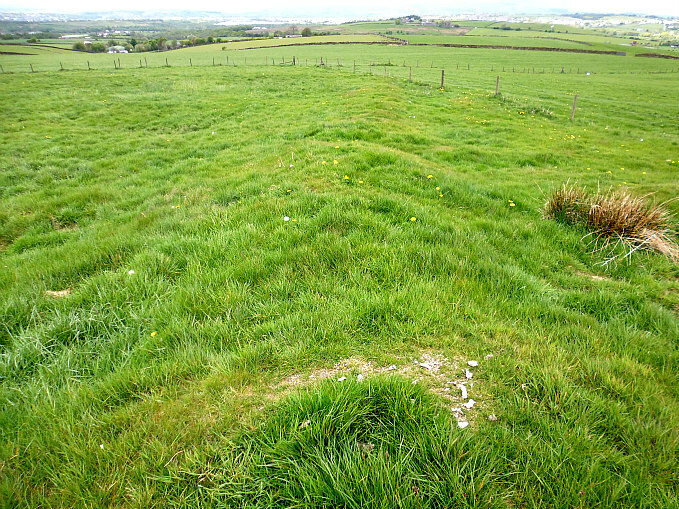 Ring Stones Earthwork (western rampart looking south). This quite large rectangular earthwork measures 56m x 41m and has very well-defined outer banks (ramparts) that are curved at the corners, and there are also prominent ditches. The outer banks (ramparts) are 3 feet high in places, especially at the S, W and N sides – the bank at the E side is not quite as high. At the E and W sides the ditches are quite well-defined. The NE side has what could be an entrance with extended banks at either side running out from the earthwork for 15m – and a trackway or path traversing from east to north-west across the inside of the site, although these could be a more recent features? The NW side has a circular (banked) feature with large stones inside, which could perhaps have been a 17th century lime kiln? At the W and NW sides, in particular, the outer banks (ramparts) have large and small stones embedded into them at intervals – an indication of how these were built. At the NW side a second, smaller earthwork measuring 18 yards square can just be made out – although this is now very faint in the ground and only just visible. Ring Stones Earthwork. (Western rampart looking north). The author Walter Bennett in his acclaimed work ‘History of Burnley’ did a survey of the earthworks in 1946. In this he called the site: “an enclosure that is 50 yards square with ramparts 2 yards wide and 1 yard high with an outer ditch 2 yards wide.” He says of the smaller enclosure: “It is 18 yards square.” He goes on to say: “the site was excavated in 1925 at which time a gateway 7 yards wide at the SW side was paved with boulders laid in a gravel foundation. At the S side there was a drain. A regular course of large stones flanked the gateway entrance at either side, and a floor of gravel and flat stones or cobbles. The rampart was built of earth and stones. There was a well-constructed road 7 feet wide which ran towards Bottin Farm on the Worsthorne to Roggerham road.” This is ½ a mile to the west. Could this have been the ancient straight trackway which runs back down to Gorple Road, or another track that heads north-west from the site to Swinden? Ring Stones Earthwork (from the south-east). But what makes this site interesting is the fact that a smaller, square-shaped earthwork feature joins onto the larger one at the north-western side, although this is fainter and more difficult to make out at ground level. So was this also a Romano-British farmstead, or was it something else? Almost certainly it was linked to, or was part of, the larger farmstead. It may be that this structure, and the larger one, only lasted for a short period of time because at that ‘time’ in Late Roman Britain, especially in the northern parts of the empire, daily life was becoming difficult with warring factions and tribal infighting on the increase – the Roman army now almost incapable of holding these rebellious northern, British tribes back. And soon the Roman army would retreat back to Gaul. Britanniae would then be left to its own devices! 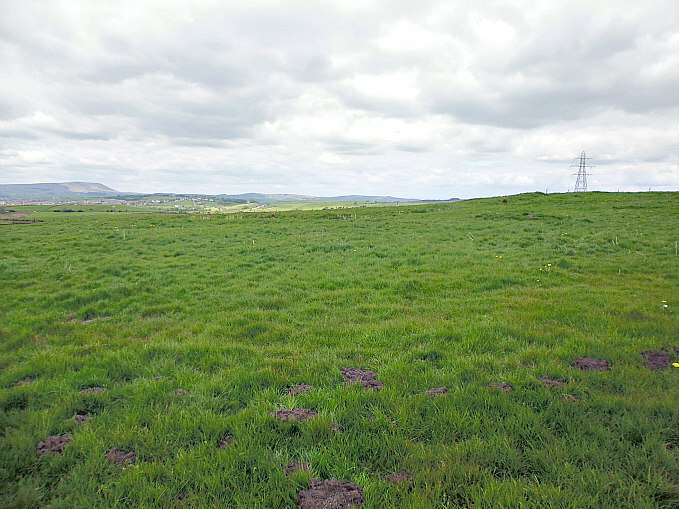 But the question must be asked: what was this Late Roman farmstead or camp doing here at the east side of Burnley? Bennett, Walter, History Of Burnley – Vol I, Burnley Corporation, 1946. Hall, Brian, Burnley (A Short History), Burnley and District Historical Society, 1977. 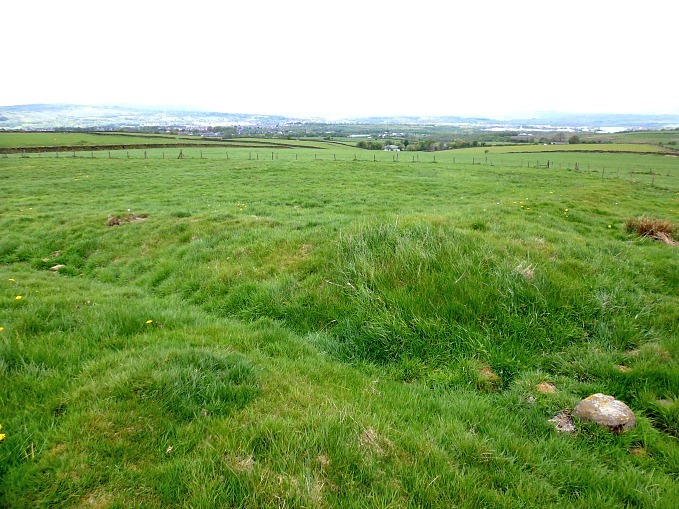 Categories: Earthworks, Roman Sites | Tags: Ring Stones Earthwork at Worsthorne near Burnley in Lancashire | Permalink.